Labor budgets can be set when creating or editing a Job. 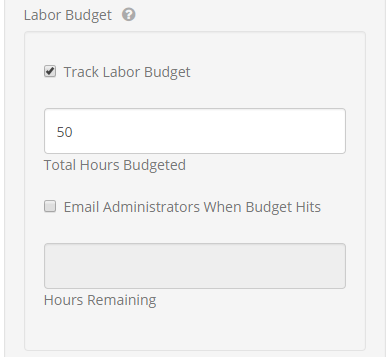 To enable Labor Budget Tracking, check the first box in the Labor Budget section of the Job form. Next, put the total number of labor hours budgeted for this job in the "Total Hours Budgeted" field. As your employee's track time against this Job, ClockShark will let you know with an email alert when the total budget of hours has been used. 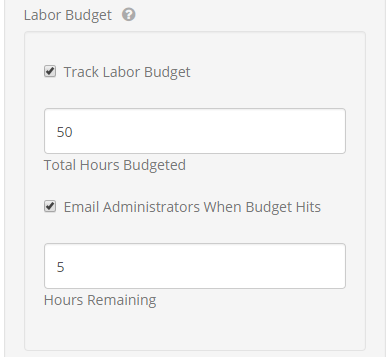 If you want to get an email before all the budgeted hours are gone, you can check the "Email Administrators When Budget Hits" checkbox, and add the number of "Hours Remaining" to the field below.